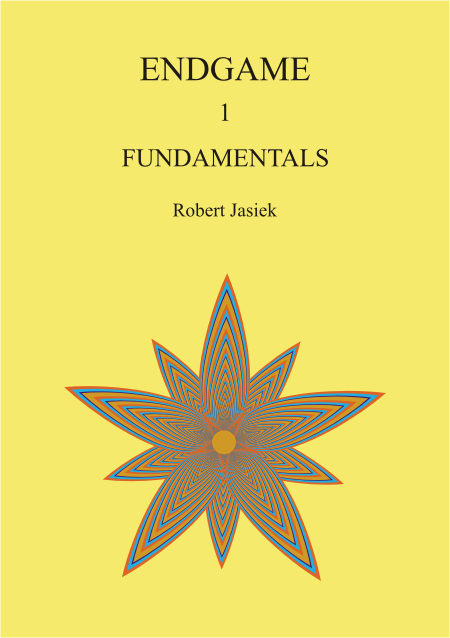 The author and publisher of Endgame 1 - Fundamentals is Robert Jasiek. The book is of A5 size, has 264 pages, has 7 diagrams per page on average, is written for players from 18 kyu to 1 kyu and has the suggested price EUR 26.5 (book) or EUR 13.25 (PDF). Looking at the endgame literature creates the false impression that the endgame would consist of mainly value calculations and tesujis. However, a study of the frequencies of endgame mistakes by kyu players reveals that only the fourth most frequent kind of mistakes concerns tesujis, and mistakes related to value calculations are much less frequent. Endgame 1 - Fundamentals includes both the most frequent kinds (mistakes related to choosing the locally best move, reading, sente) and every other kind. Volume 1 makes one exception: it forgoes the tedious topic of value calculations and leaves it for Volume 2. Although this book contains every other relevant endgame topic, learning and applying the theory is made easy. Besides introductions, occasional reminders of what has been learnt and the detailed index, the twelve major chapters of the book discuss every relevant topic of the endgame. The most important topics have the longest chapters with subchapters explaining all essential aspects. Since Endgame 1 - Fundamentals has a detailed structure of its 57 topics in the subchapters, every topic receives a usually only short explanation of the theory, one general principle and a few examples illustrating their application. Nevertheless, the contents is understood easily because the theory and principles are kept simple, related subchapters and countless diagrams are available, and many problems provide the necessary practise. A few subchapters have longer explanations, a few principles, methods or a definition of an important concept. The first three major chapters cure the reader's negative strategy, when losing points, suffering from the seven aspects of conquering neutral intersections or making premature endgame. While these seemingly trivial topics are often neglected elsewhere, here one can improve several ranks already by learning to avoid superfluous moves worse than passing and worthless moves in neutral regions. When the reader is ready, the following chapters teach him the heart of positive strategy by taking more than the opponent while considering both the global positional context and the locally best endgame. Besides all the basic concepts of the endgame, such as efficiency, corner ko or double purpose moves, he becomes familiar also with the endgame aspects relevant during the opening and middle game. Besides the topics 'weaknesses' and 'attack and defense', the chapter 'ko' explains to respect numbers of ko threats, not to waste threats and avoid loss-making threats. A chapter of intermediate length exhibits the dozen most frequent kinds of endgame tesujis. Since reading move sequences and decisions correctly is one of the most important topics, it does not only receive its own chapter. Reading is emphasised throughout the book in the more demanding examples and problems. Of course, there cannot be an endgame book without sente and gote. However, Endgame 1 - Fundamentals goes beyond your usual distinction from double and reverse sente by clarifying how to identify and verify sente, the ordinary order of endgame moves, its exceptions and quite a few other aspects. Every major chapter concludes with problems. The 229 problems and their answers fill half of the book. The answers are as detailed as necessary: they show all relevant variations so that the reader can verify the quality of his reading. The difficulty varies. Except for absolute beginners, kyu players of all ranks find enough suitable problems whose solution requires to overcome one's current playing strength. Besides ordinary next move problems, other problems create special tasks, such as explaining or correcting a mistake, comparing Black's versus White's first move or finding the sente moves. Many theorists like to divide the game into 3 sections: opening, mid-, and endgame. This is a convenient categorization for focusing on different aspects of play but tends to lead beginning to mid-range players to feel that special considerations are required for each of these separate segments and play must drastically change over the course of a given game. Instead, many of the same principles hold true through the entire game, just with some trumping others as priorities shift and stakes change. The opening can contain dramatic grabs for power and influence as large portions of the board are claimed and challenged. In the midgame, violent jostling and pushing where the life and death statuses of groups are challenged and confirmed. The endgame then is often relegated to the final contestation of boundaries where only a handful of points can change hands. But this is the final chance for either player to catch up or exploit overlook weaknesses. And as such it can be one of the more straightforward parts of the game for mid-range (upper DDK-SDK) players to hone their skills in and (in a relative sense) easily pick up at least a rank or two by eliminating mistakes and eking out every available point instead of letting them dribble through their fingers. With both of the above topics in mind, Endgame 1 Fundamentals leads the reader through the important topics though present through the whole game, take on a much more concrete form in the final stages. Speaking from personal experience, territory vs. influence discussions (for example) can make conceptual sense to the early/midrange player but making accurate estimates of the relative values of widely different play sequences can be very difficult in practice. But applying the same concepts to 1-8 point differences on a given part of the board is much easier to grasp and quickly execute in actual play. As the title states, this book is not an exhaustive treatise on the relative merits of half-point plays and repetitive counting exercises but instead focuses on the appropriate concepts that guide effective and proper endgame play. From a book layout perspective, each topic is given a thorough introduction with ample demonstrations followed by a set of exercises. The focus is on the concepts and not any excessive level of detailed terminology. I appreciated the descriptions detailing the correct answer to the problems but even more important was the explanations accompanying wrong plays. Many Go books short this aspect and can leave the reader asking “What was that wrong with that move?” due to misreads or (momentary) lack of understanding of the point. Endgame 1 Fundamentals does not let the reader down and thoroughly points out the shortcomings in incorrect answers proving why the correct solution is such. Some sections go into very detailed analysis of how a given position is safe or defensible as stands (and not requiring an extra wasted play). At first glance these may seem excessive, but as a SDK-player I found value with the demonstration of just how the given situations can play out. It makes for good reading practice in a guided environment and is much more satisfying than a dismissive, “The life/connection of the group is assured”. Covered topics include superfluous moves, identifying neutral points, playing endgame moves too early, efficiency, and the categorical range of endgame sequences from double sente to gote. One aspect that I was glad to see included was mutual reduction as a threat response. At my current level of play, this is one part of the game that I know I need to be much better at recognizing and working with but find hard to apply in practice. It seems relatively simple and easy to react to every challenge to my real (or potential) territory by solidly defending and hoping my time to counter will come soon. Instead, I should be looking to counter with equal (or larger) threats instead of meekly replying. Maybe I’m focusing on this too much but it seems to be a key concept to better play (across all segments of a game) that could help lift my skill (and rankings). Another point that comes across while reading Endgame 1 Fundamentals is that many of the attributes of good endgame play are present through an entire game play sequence and are not unique to the last stage. Careful reading, acquiring and retaining sente, efficiency of play, and global assessment of play choices are vital from the first move to the last. Even though almost all of the examples in this book are set in solid endgame positions it becomes clearer and clearer that midgame and even opening sequences follow similar principals and the actual endgame possibilities are built upon the previous application through the game. I found Endgame to be a useful study reinforcing concepts that I was aware of but tend to neglect during actual play. This book should go a long way towards producing more thoughtful play that will lead to more success on the board. Having neglected the study of endgame, I felt it was time to buckle down and read up on it. Honestly, I always felt endgame was boring. And to be really honest, it is still boring, but this book has actually made it a bit more interesting for me. The first thing that stood out to me was Mr. Jasiek’s style of writing. I will admit, I had some prejudices about how he has been said to use too much of his own terminology instead of the (in the West) standard Japanese terms. In case anyone else has gotten the same impression, let me just tell you that it is wrong (at least in this book). His writing is very precise, clear and to the point. Together with the (many) diagrams I had no problem understanding what was to be understood. The author also makes it clear in the beginning that advanced value calculations and so on are left to the next volume. In this one we will get stronger by learning to avoid the common mistakes and improve our reading. “Laziness is the road to losing the game. We must always strive, assiduously, to play the best move. Pay attention to details at each turn and you improve several ranks!” (Jasiek, p. 102). The book is divided into 13 chapters, each dealing with a different aspect of endgame. Starting with the basics, like playing moves that have value (Yes this sounds super simple, but a reading mistake can easily make you play on dame and thus wasting a move) and continuing with endgame theory, best moves and beautiful endgame tesujis. Each chapter is systematically divided into different subjects, each with several diagrams on both correct and incorrect variations of that particular topic. This is then followed by problems, answers and a conclusion that sums up what has been taught so far. The table of contents is viewable on Jasiek’s website (link at bottom) and just looking at it you will see what the book covers. Actually, I would even like to say that the detailed index is a big strength of the book, since it is very easy to look up a certain aspect of the endgame. But now on to why I think this book is a bit different than what you might be used to; the problems. In my experience, when you look at problems in a book the board positions are often pretty clear, often taken from professional games (modified to fit the situation sometimes of course). In Endgame 1 Fundamentals the positions can sometimes look a lot more like my own games, showing endgame sequences in a situation that isn’t your standard local corner/edge endgame type of thing. Don’t worry, all these things are also covered. My very subjective kyu-level feeling is that the problems feel a bit more realistic and original. In any case, the quality of the problems is good, and the answers are great. Several incorrect variations are shown, each explained why each is inferior to the correct line. There are also times where for example the line “mistake II” has follow-ups in the form of “White’s correct reply” and continuations of correct endgames after this. Even if black makes a mistake in the endgame, if white doesn’t find the correct move and just answers automatically, black might get away with the mistake and actually take an extra point anyway, even though he really should have lost a point. The answers do a good job explaining these sequences. I think Endgame 1 Fundamentals does a good job at covering the important aspects of the endgame. Keep in mind my study of the endgame prior to this book has consisted of endgame problems found in general problem sets or other books covering endgame just briefly. However, I can’t really think of what a kyu player need to know about the endgame more than what is covered here (though I guess I can’t know what I don’t know right?). I think the shortest way to describe how to get better at endgame would be “Don’t be lazy”, and this book shows how big of an impact laziness can have. I will keep reminding myself to not be lazy and read read read, till the last move. Every point counts in the end. The author recommends this book for anyone in the 18 kyu - 1 kyu range. I think players players around 10-13 kyu would see the biggest results by studying this book. Before reaching 13 kyu I think it is more productive to study middle game and just do tsumego, but the content is indeed comprehensible for a high DDK player. My general negative feeling about endgame might influence me here though. Me being around 3-4 kyu KGS I had kind of figured out a lot of the basics by myself, but repeating it was still worthwhile. Still, the book contained a lot of things I had never thought of so I understand the stated 1 kyu - 18 kyu range. If you are around 1-3 kyu and have studied endgame before, I don’t think you will learn much new here. But even if this book only had the problems, I would still buy it and recommend it to others since they felt fresh and interesting. I’m not saying the book is the best thing since sliced bread, but it covers endgame in a clear and systematic way along with good problems, which was what I was looking for. At last I want you to note that the book was donated to me by Mr. Jasiek for me to review. This was actually a happy coincidence, since I was at the time looking for a book on endgame and saw the opportunity to get this one for free. The price of the book is in my opinion a bit high. I have no idea what the cost of writing, printing and publishing a book is, but 26,50€ plus shipping is on the more expensive side for a go book. However, buying it as a PDF for 13,25€ is a great price, so I would recommend you doing that unless you really prefer an actual book. Would you still want the book after reading the PDF, Mr. Jasiek let’s you buy it for half the price. Alexander "cinders" Söderberg, 3-4 kyu KGS, September 2015.